Kiss Nail Products may try to argue that the mark Iconic is only descriptive on the spectrum established in the Abercrombie case, and therefore, must also prove secondary meaning. Abercrombie & Fitch Co. v. Hunting World, Inc., 537 F.2d 4 (2nd Cir. 1976). Because the “ICONIC” mark has not been in use for five consecutive years, the registration is still contestable. However, due to its successful registration House of Lashes would likely have a more successful argument that Iconic is suggestive when used for false eyelashes and is inherently distinctive. Additionally, House of Lashes could also potentially prove that its mark and trade dress has acquired secondary meaning through the immense advertising, large social media following, and volume of units sold. House of Lashes seeks preliminary and permanent injunctive relief that would prevent Kiss Nail Products from using the Iconic trademark and packaging. 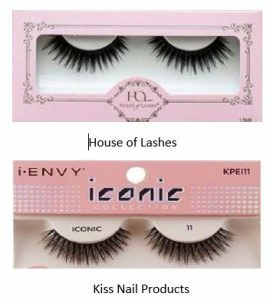 House of Lashes also requests the defendant’s profits from the sale of the allegedly infringing goods, other available damages, attorneys’ fees, and the destruction of all advertising and sale material with the Iconic label. The case is House of Lashes v. Kiss Nail Products, Inc., Case 8:18-cv-01361 (C.D. Cal. 2018).